Planning a youth garden camp takes time, creativity and a lot of help! I have led this particular youth camp for several years now and strive to make each one hands-on, educational and fun. This year we had 70 campers whose ages ranged from 5-15. Fortunately, I had 18 extension master gardeners, whose ages I will not mention, volunteer to help. 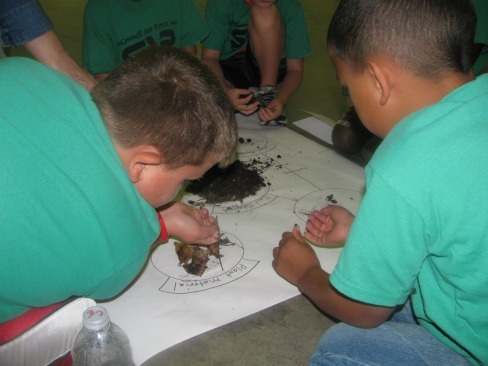 The campers were all part of a 4-H program at the Air Force Base. They arrived at the extension office in color coordinated shirts and were eager to get their hands dirty… well most of them. We set up six stations and throughout the day the campers rotated to each. My station was entitled “SOIL.” Soil can be so much fun! Who doesn’t like to get a little dirty? Come to find out, there are a few kids who don’t! Rest assured I lured them into the dirt of soil and they did get their hands dirty. Next I wanted the campers to see and touch soil. Recently, Nutrients for Life, released “Nourishing the Planet in the 21st Century: A curriculum model for elementary science grades 3-4.” The first investigation model provides an activity where students separate the different components that make up a soil sample. I put a small soil sample in the middle of a large piece of white paper. I instructed the campers to separate the entire pile into four different piles. Of course, I made sure the worms and roly polys were at the bottom of the pile. There were shrills from the campers when the live objects were found (giggle, giggle). Filtering through soil is such a simple activity. 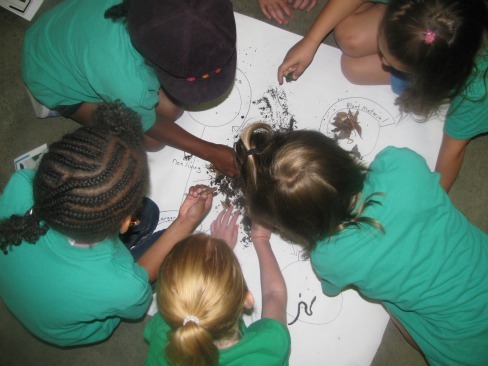 Allowing them to touch, feel, and explore a small pile of soil was gratifying to me and educational to them. Now they know that all soil is not the same, it has living and non-living components, and contains the nutrients plants need to grow the food they eat. After washing their hands, the campers rotated to other stations. They went on a scavenger hunt, walked the nature trail, harvested and ate potatoes and onions straight from the garden, planted tomatoes, created garden monsters and learned how wheat is grown and harvested. The day ended with happy campers and tired master gardeners. 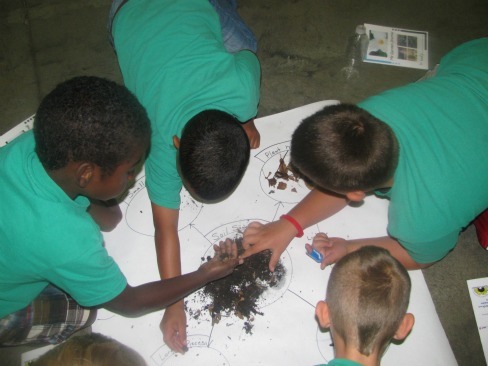 All in all, it was a great day to experience gardening in the form of a day camp. If you are interested in the Nutrients for Life curriculum, you can order it for FREE (yippee) from our website. We also offer a $50 grant to cover the cost of supplies for activities in the curriculum. Check out this video from a teacher who utilized the curriculum with her students.